The Garmont Tower Trek GTX was comfortable right out of the box, as exclaimed by a handful of satisfied owners. The majority appreciated the ankle support from the boot's high collar. A few backpacking experts praised the Schoeller stretch fabric on the upper as it conformed to the shape of their foot. Some outdoor enthusiasts were surprised with the lightness of the Tower Trek GTX. It required virtually no breaking in, as testified by several users. A considerable number of hikers applauded its impenetrable waterproofing. A couple of backpackers said that the Tower Trek GTX from Garmont runs small. The Tower Trek GTX from Garmont rendered a satisfying performance on the trail. It was complimented by experts and neophytes alike. Its prime aspects include comfort, support and lightness. 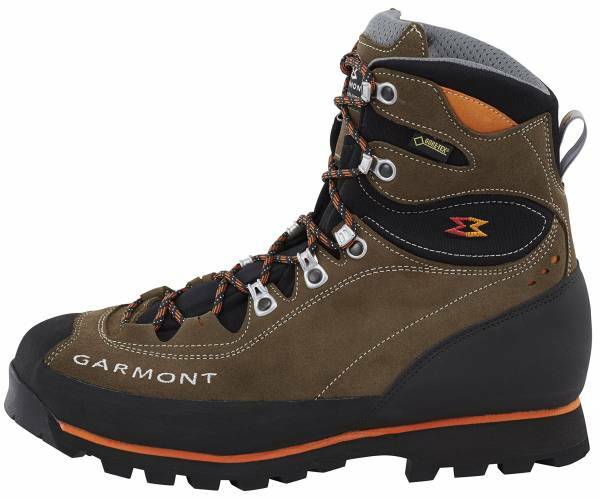 To summarize, the Garmont Tower Trek GTX is a high-cut boot that grants the necessary features on backpacking trips. The most comfortable backpacking kicks on the market. If you're looking for a true mountain trekking boot, the Tower Trek should be at the top of your list. I am thus far, pretty impressed with them. Protective materials and a thick outsole mean this mountaineering boot will last. Garmont created the Tower Trek GTX as a lightweight backpacking boot designed to overcome challenging terrain. It has a leather upper with Gore-Tex, an elastic Schoeller fabric and the brand’s set of components called Anatomically Directed Design (a.d.d.) feature. Its component sole, the Tower Trek, includes a microporous layer, FrameFlex Mid nylon insole, dual-density rubber midsole and a Vibram New Winkler outsole. This unit promotes comfort and addresses stability and security on the trail. The Garmont Tower Trek GTX is a high-cut backpacking boot that fairly runs true to size. It comes in standard width and regular sizes. The boot has a spacious instep and forefoot. The brand’s a.d.d. includes components contributing to the fit. One is its roomy toe box which allows a more propulsive and balanced stride. The Precision Lacing flexes with the foot to make each step comfortable. The Vibram New Winkler outsole features multidirectional, aggressive lugs which make the Garmont Tower Trek GTX bite on virtually all types of terrain. The strategic spacing of the tread pattern does not allow mud to build up and it channels water out to prevent slips. Providing lightweight comfort is an Alveolen footbed (EVA, resin and felt). It is backed by a 2.5 mm microporous layer that goes on top of the FrameFlex Mid nylon insole for a more cushioned and comfortable ride. The nylon insole flexes with the foot and brings stability when carrying heavy loads. A bi-density rubber midsole enhances cushioning and stability. It also features the Progressive Lasting Board that yields rigidity regardless of the length of the boot. This backpacking boot is crampon-compatible. Rendering durability and waterproofness is the suede leather upper lined with Gore-Tex Performance Comfort laminate. It is coupled with a one-piece construction of the flex insert, tongue and collar for optimal flexibility. A 360-degree rubber rand reinforcement renders protection against scuffs. Garmont’s proprietary Anatomically Directed Design (a.d.d.) enables the boot to work with the natural biomechanics of the foot. The asymmetrical cuff and anatomical tongue promote comfort and stability. Differential ankle pads secure the heel, and its precision lacing helps keep the foot in place. Additionally, the brand’s Intelligent Flex System allows shin mobility and forefoot flex. This boot is compatible with strap-on crampons.